Best integrated graphics: which to choose? If you want decent PC graphics, get a proper plug-in card. A simple solution for happy computing. After all, isn't integrated graphics of any kind absolutely awful? That certainly used to be the case. However, ever improving manufacturing technology is allowing more transistors to be crammed into chips on the cheap. Integrated graphics performance is on the up - whether it's on the laptop or the desktop. What's more, both Intel and AMD are planning to base most if not all of their future PC processor designs on the so called "fusion" philosophy. That's a CPU and graphics core combined in a single chip. Put simply, "integrated" is no longer a dirty word. So, here's our guide to the best integrated graphics currently available. When it comes to Intel processors, the choice is actually very simple. That's because Intel's dual-core Pentium, Core i3 and Core i5 processors are CPU-GPU fusion designs. In other words, the integrated graphics is inside the processor leaving you with no choice. Known as Intel HD Graphics, it sports just 12 unified shaders. To put that into context, a high end Nvidia desktop GPU has nearly 500 shaders. We are not, therefore, talking about world-beating gaming grunt. However, compared integrated GPUs currently available for AMD platforms (more on those in a moment), HD Graphics is reasonably competitive. Moreover, it does support DirectX 10 and will allow you to play most games so long as you knock the graphics options down to minimum and don't mind a bit of jerkiness. Much better is the HD Graphics's 2D video acceleration. All the usual codecs suspects including H.264 and VC-1 are supported along with hardware acceleration for Flash video. AMD is just putting the finishing touching touches on its own fusion processors. But for now, AMD platforms based on Athlon and Phenom processors keep the graphics functions separate from the CPU. That means you can mix and match the processor and integrated graphics core. Essentially, you choice boils down to motherboard chipsets with integrated graphics from AMD itself or Nvidia. AMD's latest and greatest integrated chipset is the 890GX. In truth, the integrated core is essentially carried over from AMD's previous 7-series chipset. However, with 40 AMD-style stream processors, a clockspeed of 700MHz and DX10 support, it's a tolerable 3D core for casual gaming. It also sports AMD's UVD2 video acceleration features including full Blu-ray and Flash video decoding. As for Nvidia, its top integrated is the GeForce 8300 mGPU. It's over two years old, which is a relative eternity in PC technology. However, with 16 of Nvidia's stream processors and DX10 support, it cranks out 3D performance only slightly behind AMD's trend-setting 890GX. Again, the GeForce 8300 has a strong 2D video acceleration feature set. Integrated graphics is currently at a tipping point. Both AMD and Intel are currently cooking up new fusion processors that will offer much more powerful integrated graphics cores. Rumour has it AMD's upcoming Llano fusion chip might have 400 stream processors. That's 10 times more than its current integrated offering. 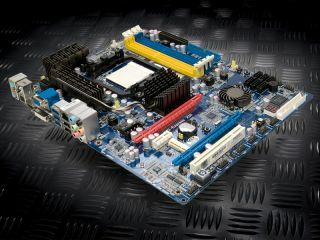 Similarly, Intel has been making bullish noises about the integrated core in its upcoming Sandy Bridge family of CPUs. In terms of raw graphics grunt, our money is on AMD. But however it turns out, the title of "best integrated graphics" will no longer be a case of damning with faint praise.